I've collected the District's April sales data and have begun processing it. I probably won't post results until next week - this weekend begins a heavy travel month for me [please pray that US Air, Midwest, and Continental don't go belly up on me!]. 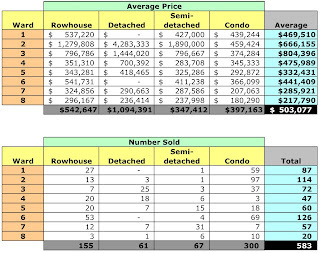 However, the tables below depict preliminary data on average sales prices and number of units sold. I've noticed quite a few homes "sold" to financial institutions this month, including three to IndyMac and six to Deutsche Bank. It also appears the governments of Canada (a friendly "welcome/bienvenue" to my new Canadian friends) and Jordan were big buyers in April: five condos and one home for Canada, one $5.5MM home in Kalorama [Ward 2] for Jordan.